In the 1980s, people living on houseboats in the San Francisco Bay were puzzled by a droning hum of unknown origin that started abruptly in the late evening and stopped suddenly in the morning. A nest with male and female midshipman fish (Porichthys notatus) and developing embryos attached to the rock. 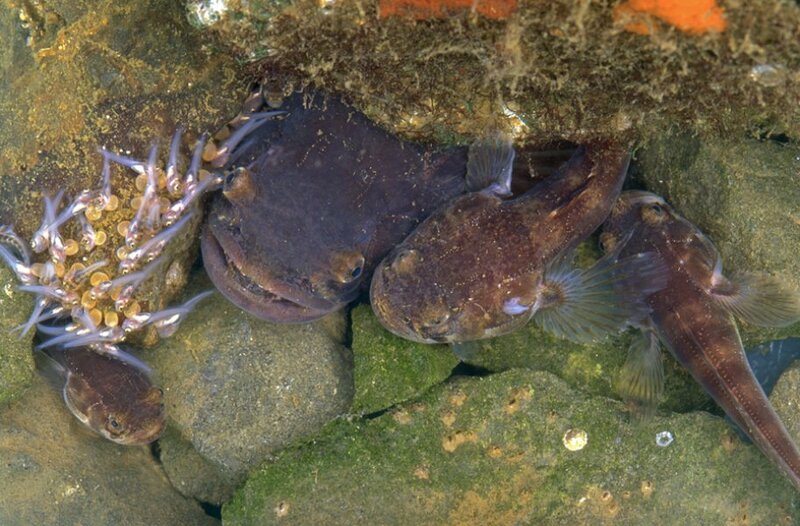 A lengthy investigation revealed the culprit: male plainfin midshipman fish (Porichthys notatus) that sing at night to attract mates. The fish, which can grow to 15 inches in length, live along the Pacific coast from Alaska to Baja, California. A study published online Sept. 22 in the journal Current Biology reveals how melatonin, a time-keeping hormone, and daily light cycles keep the nocturnal fish singing through the night. Very little is known about the roles of melatonin and circadian rhythms in nocturnal vertebrates, including fish that vocalize during mating season. Other studies on diurnal (day-active) songbirds have shown that melatonin suppresses singing at night but increases the duration of syllables when these birds do sing. In the current study, the researchers found that melatonin had an opposite effect on these nocturnal fish compared with diurnal birds: Its release provided a “go signal” for night singing. But similar to diurnal songbirds, the hormone also acted to lengthen calls when the fish sang. “Melatonin is an ancient and multifunctional molecule that is found almost ubiquitously in the animal kingdom,” said Ni Feng, Ph.D. ’16, a former graduate student in Bass’ lab who is currently a postdoctoral researcher at Yale, the paper’s first author. In the study, the researchers brought wild-caught midshipman fish into the lab, where they could control lighting. In one experiment, they tested if the male fish’s daily nocturnal song was controlled by an internally generated circadian rhythm. They put the fish in constant darkness without any light cues for seven days at a time, and found the fish still sang but on a 25-hour schedule, so they started one hour later each night. To understand melatonin’s effects on behavior, fish were exposed to constant light for 10-day stretches. The pineal gland produces melatonin in vertebrates but only in the dark, and constant light significantly suppressed the fish’s humming. But when fish were given a melatonin substitute, they continued to hum, though at random times of day without a rhythm. Finally, Bass and Feng located specific melatonin receptors — sites where melatonin triggers an action in the brain — in brain regions that control reproductive and social behaviors, including vocal initiation centers, the same as in birds and other vertebrates. The study was funded by the National Science Foundation, Cornell Neurobiology and Behavior Animal Behavior Grants, and Sigma Xi Research Grants. Story Source: Cornell University. Original written by Krishna Ramanujan.